Product #1812 | SKU 384 | 0.0 (no ratings yet) Thanks for your rating! 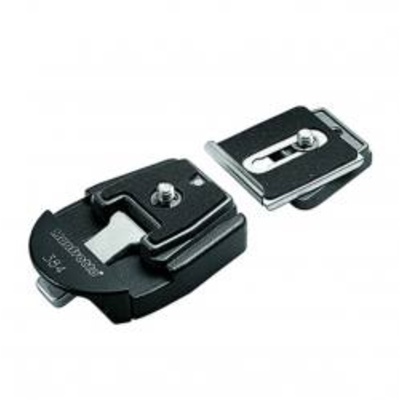 The Manfrotto 384 Dove Tail Quick Release Adapter Assembly is a quick release system that provides an extremely secure connection with its tapered "dove tail" design, and is compact and light weight. The plate slips easily on and of the base, and features a 1/4-20" screw and a removable video camera alignment pin. Supplied with the adapter is also the 384PLARCH-14 Architectural plate, which provides alignment support for 90° shots with 35 mm SLR cameras.